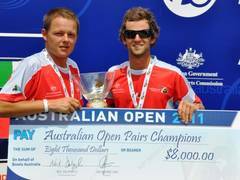 The 2011 Asia Pacific Championships for lawn bowls is set to return to Australia in 2011. Team Canada will consist of Ryan Bester, Mike Bester, Michel Larue, Cary Manns, and (myself) Greg Wilson along with ladies, Marg Lepere, Amanda Berg, Kelly McKerihen, Harriette Pituley, and Jackie Foster! (Team order yet to be announced) Scheduled for November 26 to December 11, the event will be held at Lockleys and Holdfast Bay bowling clubs, hosts to the 2012 World Championships. The event will incorporate 23 countries from the Asia Pacific region, with five males and five females representing each country. Each player will compete in either singles or fours, and pairs or triples. Medals are awarded to the winners, runners up and semi finals in each discipline. An overall team trophy is awarded to the country with the best aggregated results in each gender category. Live streaming of matches over the internet (link to be included at a later date) will occur for six singles and six team matches, with all 12 matches being shown on Australian television in one hour packages. Countries competing include; Australia, Brunei, Canada, China, Cook Islands, Fiji, Hong Kong China, India, Indonesia, Japan, Korea, Macao, Malaysia,New Zealand, Norfolk Island, Nuie, Papua New Guinea, Philippines, Samoa, Singapore, Thailand and the United States.